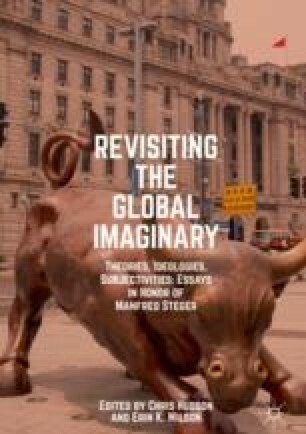 This chapter is a critical analysis of the discourse employed by powerful representatives of Google with respect to how they present ‘the future’ in their public statements, arguing that it has powerful ideological functions, serving to legitimate and naturalize their way of understanding the world. Ström locates these statements in relation to larger histories and practices of capitalist accumulation, imperial expansion, technological determinism, and techno-scientific utopianism in order to criticize Google’s narrow vision of the world-to-come. Their vision takes a privileged and sterilized present and imposes it on the great unknown in order to present a world scrubbed clean of uncertainty and alternatives, a world that the enormously powerful corporation is actively working to bring about. Dayen, David. 2016. The Android Administration. https://theintercept.com/2016/04/22/googles-remarkably-close-relationship-with-the-obama-whitehouse-in-two-charts/. Accessed 25 April 2016. Descartes, René. 2008. A Discourse on the Method of Correctly Conducting One’s Research and Seeking Truth in the Sciences. http://www.earlymoderntexts.com/assets/pdfs/descartes1637.pdf. Accessed 18 Oct 2016. Goodman, Peter S. 2012. Eric Schmidt at Davos Praises Globalization, Dismisses Jobs Crisis. http://www.huffingtonpost.com/2012/01/27/eric-schmidt-davos_n_1237142.html. Accessed 24 Jan 2015. Google. 2014. Say Hello to Project Tango! Youtube.com. https://www.youtube.com/watch?v=Qe10ExwzCqk. Accessed 24 Feb 2015. Hardoon, Deborah. 2017. An Economy for the 99%: It’s Time to Build a Human Economy That Benefits Everyone, Not Just the Privileged Few. Oxfam. http://hdl.handle.net/10546/620170. Page, Larry. 2013. Google I/O Keynote. TechHive, http://www.techhive.com/article/2038841/hello-larry-googles-page-on-negativity-laws-and-competitors.html. Accessed 24 Jan 2015. Page, Larry, and Sergey Brin. 2008. Founders’ Letter. https://abc.xyz/investor/founders-letters/2008/. Accessed 23 Aug 2016. ———. 2012. Founders’ Letter. Alphabet. https://abc.xyz/investor/founders-letters/2012/. Accessed 23 Aug 2016. Rosenberg, Jonathan. 2009. The Meaning of Open. http://googleblog.blogspot.com.au/2009/12/meaning-of-open.html. Accessed 6 Feb 2015. Stone, Brad. 2011. It’s Always Sunny in Silicon Valley. Business Week. http://www.businessweek.com/magazine/its-always-sunny-in-silicon-valley-12222011.html. Accessed 17 July 2014. Waters, Richard. 2014. FT Interview with Google Co-Founder and CEO Larry Page. FT Magazine. http://www.ft.com/cms/s/2/3173f19e-5fbc-11e4-8c27-00144feabdc0.html. Accessed 26 Nov 2014.